Kojima says he has had no input on the upcoming Super Smash Bros. For Wii U And 3DS. One of the biggest surprises of the Wii's Super Smash Bros. Brawl was the addition of Metal Gear Solid main character Solid Snake. 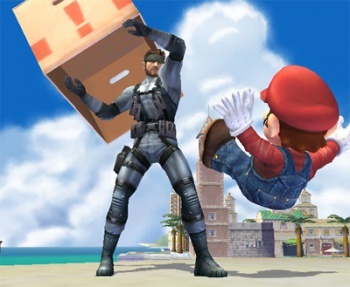 But, don't hold your breath for Snake's return in the upcoming Super Smash Bros. For Wii U And 3DS, as the character's creator, Hideo Kojima, has told Geoff Keighley that he has had no input on the game, and that Snake's return isn't likely. "I'm not working on that game, but I don't think it's likely [that Snake will return]. If Mr. Sakurai is watching this, hopefully we see Snake." Super Smash Bros. game director Masahiro Sakurai has been slowly revealing returning characters for the new game via its official website. When Snake was added to Brawl, it was alongside Sega's Sonic as one of only two non-Nintendo characters. Sonic has already been confirmed for the new game, but Snake is no-where to be seen. Perhaps he has been replaced with Capcom's Mega Man as the second third-party character? Sakurai claimed that Snake's inclusion in Brawl was due to Kojima "practically begging" for him to be put in, as Kojima enjoyed playing Smash Bros. with his young son. As he's not really had any contact with Sakurai for the upcoming game's development, unless Sakurai felt somewhat attached to the character, we can probably assume he's been cut. Personally, I wouldn't shed a tear for Snake. He didn't really seem to fit in the Smash Bros. universe, and his skill set was not particularly interesting.